CKC training courses are either developed in house by our senior team or by our trusted partners. They are available to all candidates and not just CKC staff. Please get in touch for dates, times and prices of our courses. Please find below a list of training courses we are offering. If you are interested in any of the sessions, please contact us for more information and to book your place. We are always looking to expand our portfolio of courses and if there is specific area you would like us to develop a training course on, we would be happy to look into this. We are happy to work alongside other training providers to deliver courses to. Please get in touch if this would be of interest. Who is the course aimed for? This course is for staff that are new to playwork and would like to understand the play approach in their work environment as well as understand how to support children’s play in line with the playwork theory. Course description: This course will look into the playwork principles, play types and what we mean by play. Who is the course aimed for? This course is for staff that are new to playwork and would like to understand how they can help children in developing the play environment in their day-to-day play at the setting. Course description: This course will focus on the play space within the setting and will help the practitioner to understand how to improve both the indoor and outdoor environment In line with children’s choices. Who is the course aimed for? Any practitioner, from new staff to more experienced ones working in breakfast, after school and holiday clubs. Course description: This course will explore the characteristic of teamwork and aspects of effective teambuilding and look at the different responsibilities within the team in a play setting. Course description: Participants will look at their own practice as well as the ones of their colleagues. Participants will explore the values and beliefs behind their actions and reflect on their taken-for-granted knowledge to challenge them. Additional information: Due to the nature of the course the practitioner attending this course must be very motivated in their development and in the application of the playwork theory. Course description: The certificate is a full course consistent with the criteria set out in Annex A of the Statutory framework of the Early Years Foundation Stage (March 2017). Section 3.25 of the Statutory framework of the Early Years Foundation Stage (March 2017) states: ‘At least one person who has a current paediatric first aid (PFA) certificate must be on the premises and available at all times when children are present, and must accompany children on outings’. Additional Information: Full day course, therefore recommended that you bring lunch. Who is the course aimed for? For all staff working within the early years and childcare settings, suitable for all practitioners working with children in any position as well as volunteers for sport societies. Course description: This course will help the candidate to gain knowledge of safeguarding and child protection concerns. Dates and timing: Organised twice a year, date and time could change depending on the trainee availability. Course description: This course will give the practitioner an understanding of the guideline to prepare, cook and handle food. 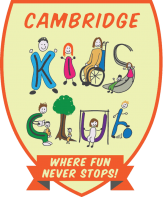 Please contact us at info@cambridgekidsclub.com for booking this course. Location: Online training - therefore can complete at candidates availability. Our offices are available to complete, on request if access to a computer and the Internet is a problem. Course description: The Level 3 Diploma in Playwork is aimed at staff working directly with children and young people in a setting whose main purpose is to provide them with opportunities for freely chosen, self-directed play. Support: You will be assigned a personal assessor – an experienced practitioner who is there to help and guide you. You will build up evidence to of what you know, and what you can do: this will be stored in a web based e-portfolio, which you and your assessor can access at any time. You will develop your knowledge through studying a mixture of printed and online resources and attending webinars: your assessor will test your knowledge by setting you a variety of tasks. Your assessor will also visit you at work to carry out and record observations of your practice. Duration: There is no fixed time – it depends on how committed you are and how easily we can carry out observations 12 to 15 months is typical but, if you are doing this qualification as part of an apprenticeship, please note that there is a minimum duration of one year. The aim of this programme is to develop play-workers to become future play-leaders, through a dedicated and specialised training plan, coupled with offering experienced senior team support and mentoring. We limit our intake to only a handful of our play-workers onto this programme, due to the dedicated support we offer as well the commitment we ask for from the candidate. The FLP is expected to last between 12 – 18 months, with the end goal of having the skills and experience required from a play-leader or deputy play-leader. We have developed a modular programme, which will cover the nuts and bolts of what is involved in playleading. Within the FLP programme we will either go through these with you or ask you to take on these responsibilities at the current club you are based at. However there is a much softer side of the programme, where we also want to develop your skills as a leader. This would be a much more individual programme of mentoring and personal development sessions. We would ask you to seek feedback from your peers and management at every opportunity as part of your reflective practice. You have a responsibility to reflect on your practice and show how you have learned from your mistakes and improve your practice and performance. This could be done as part of a diary in which you recognise events which have not worked as planned and how you plan to address these next time. We will also provide you with an opportunity to work at another setting for a period of time, to gain experience of how another setting operates and are structured.